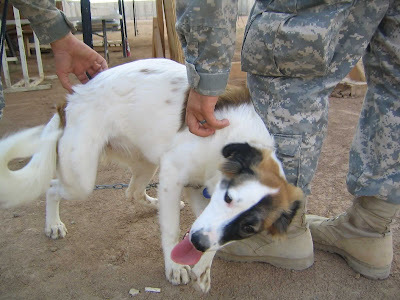 Re-posting this pic of Fergie the company dog so I can link to it.. while Jim was deployed they adopted a dog that another troop left. I have more pics of it even some with stitch but cant find then all.. anyways. the dog really seemed to boost the moral of the guys. Fergie sure did put a smile on the guys faces. I thank you and your family for your service. Wow, you are a busy mom. I can't imagine. I believe being a mom is the most important job on earth. I pray that your hubby (soldier) has a speedy recovery. I'll be following your blog. Being a mother of seven, I'm sure you have many interesting stories. I have one grandson and I love him sooo much. Grandchildren are the best. God bless you and your family. Thanks for sharing this awesome photo of an amazing dog. I have no doubt he boosted the morale of many a soldier! I'll be back to read your words again soon.